. : 2010 Olympic Cross-Country Ski Course Crew #6 – Finish Line :: Ski XCOttawa.ca :: Skiing in Ottawa and Gatineau Park :. 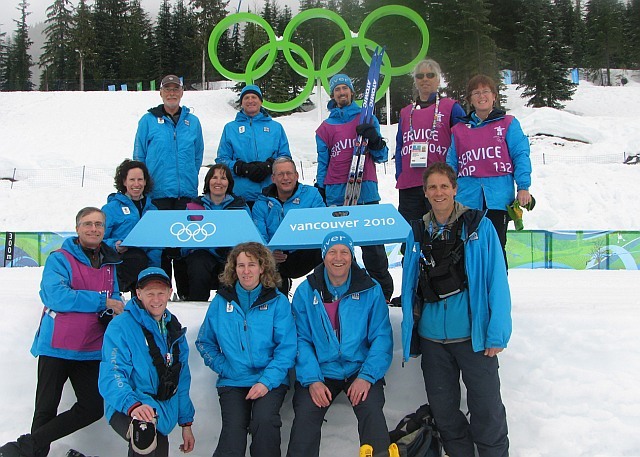 What a great Olympic Course Crew adventure it has been. A full circle on the sixteen days of training and competition was drawn to a close last weekend with the awesome finale of the mass start marathons. 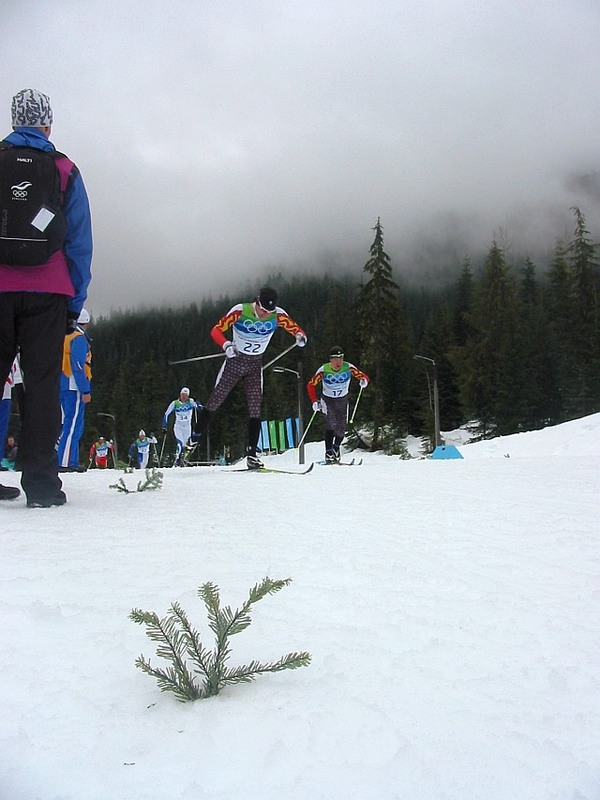 Even the rainy, misty weather of the opening days returned, replacing the glorious mid-Games blue skies, adding another layer of challenge to the competitors and the fans still captivated by the spectacle and spirit of skiers pushing themselves to the utmost. Boisterous crowds arrived, the Norwegians cheering for Marit and Petter bolstered by the red and white of the Polish contingent intent on witnessing a triumph of their champion, Justyna. Though it has been one week, I can still clearly replay in my mind the sound of the of the gun punctuating the groundswell of cheers and ringing cow bells. Placing myself trackside above the stadium amidst the coaches and photographers, I follow their lead from one vantage point to the next as the pack of racers fractures and stretches out with each lap completed. The emotion of the sprint for the finish takes me by surprise as we witness the racers striving for the line, summoning one last burst of speed after 30 or 50 km of pushing through personal barriers and ‘variable’ snow conditions. For Canadians in the crowd, the women’s marathon became a celebration of Sara Renner’s national ski team career as she powered through to a sixteenth-place finish and the rise of a new generation. The men’s side, led by Devon Kershaw in his amazing fifth-place result, thrilled us by staying in touch with the leaders or even challenging for the lead in lap after lap (and over 1700m of vertical climb), proving many wrong in their expectations (including me) of a team that was tired after a long and already successful Olympic campaign. They showed a much wider audience than usual that recent Canadian successes on the X-C World Cup circuit are no fluke and that we can look forwards to more top-notch performances from ‘our’ men and women in the next few days of the Paralympics and years until the Big Show comes to Sochi, Russia. It seemed so appropriate to emerge from the cross-country Olympic bubble via a sunlit bus ride back to Vancouver and the sea, the mountain valley echoing with the air horns of the fifty or so other buses in the area celebrating the second hockey gold. I made my way through the streets thronging with folks from all over in a generous party mood, strangers united in a celebration touched off by hockey but very much part of this whole festival of sport. There is no question that the sense of honour and delight I experienced in contributing to this Olympics was due entirely to being part of a team. Our group of twelve course markers was large enough to quickly deal with the daily set-up and take down over the 10km of competition trails and spell each other off throughout the sixteen days, though the feeling of tiredness was noticeable by the last weekend (abetted by Whistler festivities in my case). The larger ensemble of volunteers would pull together on occasion such as when we joined with some groomers, snowmobile drivers and course marshals to raise wooden barriers and Vancouver 2010 banners on either side of the ‘Big Red Bridge’ – nothing like a building project to bring people together! The team aspect was crazily emphasized by our ‘smurf-blue’ volunteer wear, a sea of which appeared in the workforce tent at each lunch hour, ballooning in the imagination to the oft-quoted total of 25,000 volunteers that approximates the population of Lunenburg, Nova Scotia, or Prince Edward County, Ontario. This certainly fires up the faith and imagination: what other great projects could such a crew accomplish together, under what circumstances? 10. Having the chance to share the experience with anyone who will listen! Before I set out for the West Coast and Whistler Olympic Park, I gave a presentation to my kids’ school on the question: what do the Olympics mean to me? 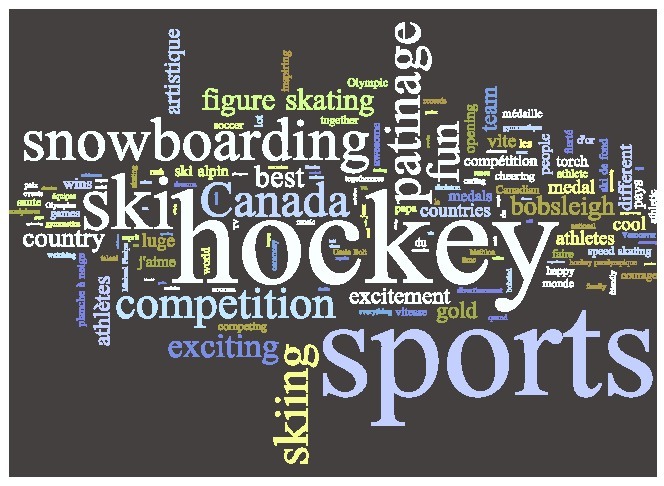 A collection of words from the students produced a visual that highlights ‘ski’, ‘hockey’ and ‘sports’ but that contains a wide range of themes from competition to peace. I will go back to the school to promote the Paralympics and share stories that, whether about athletics, volunteerism or international understanding, all come down to the idea of inspiration. I cannot ignore the issues and tensions between such inspiration and the pressures of winning or the business realities of the spectacle; Michael Barry, a Canadian Olympian and professional bicycle rider reflects on this from the athlete’s perspective [http://michaelbarry.ca/2010/02/the-games/], and still is anchored in the possibility of inspiration, of being it and seeing it in others. So in the end, the Games become a reflection and a challenge to us as ‘amateurs’ of sport and citizens of the world, challenged to be custodians of this inspiration. The last word belongs to the next generation represented by Ida, a 10-year-old from Norway, who left the following note at the base of the Olympic rings in the cross-country ski stadium: Oh Vancouver – the joy of sports, celebration for the people, but we need to ... create enthusiasm for ... making the sport cleaner and work together across the nations – help me. Thanks for reading. Go Paralympians!